Rugby World Cup champions New Zealand beat Tonga 47-9 with a bonus point at St.James Park but the All Blacks failed to live up to expectation again. The result not only means that New Zealand have qualified for a quarter final in Cardiff next weekend but also that Argentina have qualified for the quarter finals. Georgia’s third place means that they have qualified for the 2019 Rugby World Cup in Japan. World Rugby’s best side the All Blacks have stumbled their way to the top of Pool C but while everyone is aware of their quality they have yet to show any real rhythm for any length of time. Argentina, who have never beaten New Zealand, gave the World Champions their sternest test which means that they will go into the quarter finals without having been really tested. The result means that the All Blacks will finish the Pool stage of the Rugby World Cup as Pool C winners and will face the loser of Sunday’s Ireland v France match. Against Tonga All Black wing Nehe Milner-Skudder scored a brace of tries while opening tryscorer Ben Smith constantly showed his class but coach Steve Hansen will no doubt be concerned about the lack of form some of his stars are showing. Milner-Skudder also set up Ma’a Nonu for a try on his 100th cap. There will be particular concerns in the All Black camp about how their forwards again buckled under pressure, as they did against Georgia last week, which Australia would have noted after the way their pack excelled when beating England. In the backs, most of the passes stuck and crucial tackles were made as they outscored Tonga seven tries to nil. Ben Smith, Tony Woodcock, Milner-Skudder (twice), Sonny Bill Williams, Sam Cane and Ma’a Nonu in his 100th Test all crossed the line. Dan Carter landed six of seven conversions. In the first half, every time it looked as if the All Blacks had Tonga on the ropes, the islanders fought their way back using throught their powerful pack. In a dramatic end to the half Tonga were unlucky not to win a penalty try when stand-in All Blacks captain Kieran Read was yellow-carded for collapsing a driving maul. Tonga, knowing they had the All Blacks forwards under the cosh, turned down a shot at goal in favour of a scrum. 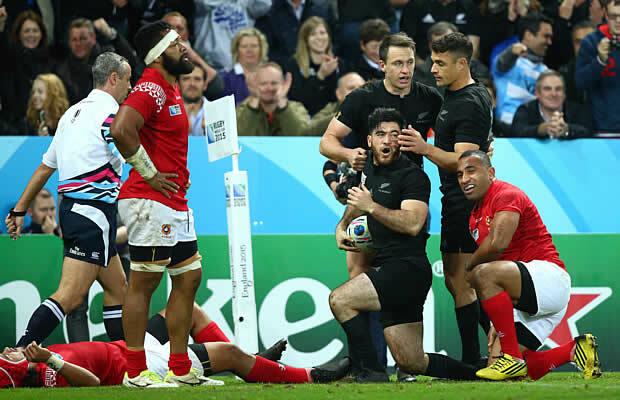 Twice the seven-man All Blacks collapsed under pressure and with referee John Lacey’s patience running out, Tonga opted for one more scrum but this time they tried to shift the ball and came up short. Richie McCaw, not playing because of a thigh injury, had a lot to say every time he took the field in his role as waterboy. Tonga made a statement at the very start when they shoved the All Blacks into submission in the first scrum. 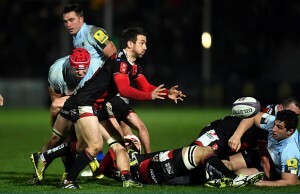 They won a penalty which took them to a lineout on the halfway which turned against them. The All Blacks stole the throw in, moved the ball wide where Milner-Skudder and Conrad Smith took play inside the Tongan 22 before fullback Ben Smith popped up in support for the try. Tonga came back, with attempts to run the ball not paying dividends they found more success with forward drives down the narrow channel which won them a penalty in the 23rd minute for Kurt Morath to close the gap. 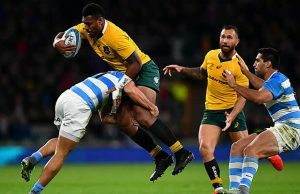 However, the All Blacks frenetic pace was opening gaps although they squandered one opportunity when Waisake Naholo dropped a pass in a three-on-one situation. But they made no mistake minutes later when Tony Woodcock barrelled over from close range. After Tonga’s valiant but eventually unsuccessful attempt to drive over on half-time the All Blacks turned with a 14-3 lead. First strike in the second half belonged to Tonga with a second Kurt Morath penalty. The All Blacks responded by running Tonga into submission until eventually a hole appeared for Milner-Skudder to scamper over for a try. He was over again five minutes later, diving on the ball after Beauden Barrett had chipped over the line. The the score blown out to 28-9, the sting was gone from Tonga allowing Williams, Cane and Nonu to cross the line. Ben Smith; Nehe Milner-Skudder, Conrad Smith, Ma’a Nonu, Waisake Naholo; Dan Carter, Aaron Smith; Kieran Read (capt), Sam Cane, Jerome Kaino; Sam Whitelock, Luke Romano; Owen Franks, Dane Coles, Tony Woodcock. Vungakoto Lilo: Telusa Veainu, Siale Piutau, Latiume Fosita, Fetu’u Vainikolo; Kurt Morath, Sonatane Takulua; Viliami Ma’afu, Nili Latu (capt), Sione Kalamafoni; Joseph Tuineau, Tukulua Lokotui; Halani ‘Aulika, Elvis Taione, Soane Tonga’uiha. Replacements: Paula Ngauamo, Sona Taumalolo, Sila Puafisi, Sitiveni Mafi, Jack Ram, Samisoni Fisilau, Viliami Tahitua, Will Helu.